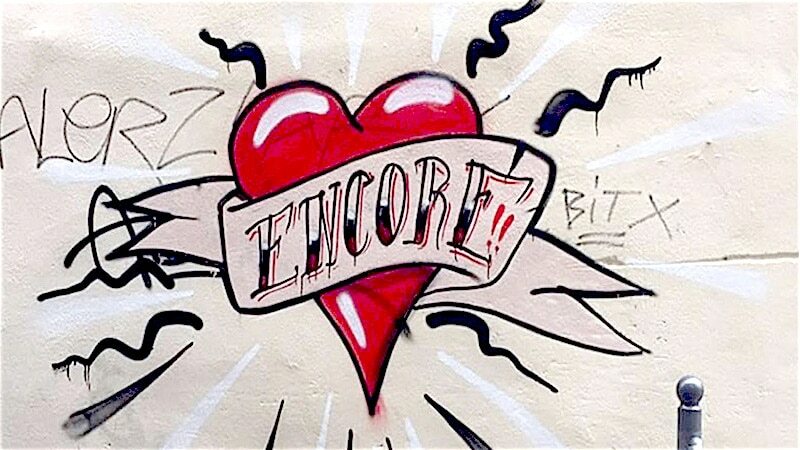 Street artist Georges de Loup popped up on the Lyon graffiti scene a year ago, but his journey began long before. His paintings evoke the pain and joy of love, in a story that is as personal as it is universal. When love takes over the city on Valentine’s Day, Georges de Loup is there to capture it. The artist known as Georges de Loup wears a leather jacket and Timberland boots. He is short, bearded, and well-spoken. Most importantly, he is a ghost. Georges de Loup is just one of the pen names this street artist uses to paint his way through Lyon. This particular pen name began a year ago, and has been spraying love across the city ever since. On this afternoon just before Valentine’s Day, he’s preparing for the most important day of the year. Valentine’s Day Special: Georges de Loup is offering to paint a personalized piece for someone you love. If you would like him to do a painting on their street or on their way to work, contact him on Instagram @georges_de_loup. On Rue d’Austerlitz in Croix-Rousse, Georges de Loup explains his mission: spraying love, and only love. 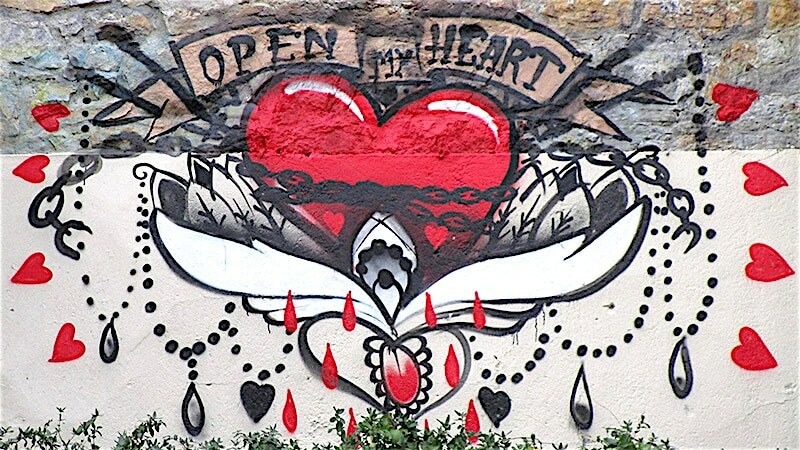 Georges de Loup covers the city streets in hearts, from Croix-Rousse and Perrache to Guillotière and Jean Macé, sending messages of love and suffering to the people of Lyon. 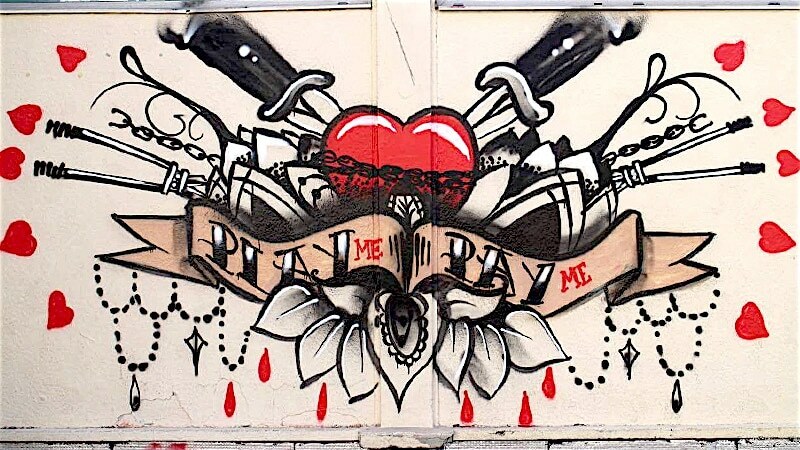 Chains, knives, petals and blood all speak to the story of this artist, and the character he uses to heal his heart. It’s an interpretation that brings out the darkest torments of love while at the same time deciding not to give up. Georges de Loup is at his core a romantic, and Valentine’s Day is one of his favorite days of the year. But he also knows the double-edged sword that love can be, and his paintings pay as much homage to that as to its beauty. “The dark side of it is on Valentine’s Day a lot of people are very sad,” he said. The Georges de Loup persona offers the artist a way to explore these contradicting feelings without the influence of his other pen names, which each have their own personalities. At the time of its creation, it was a way for him to let go of the pain of the past. The name Georges de Loup, which sounds like the metro station Gorge de Loup, is a private joke for people who know Lyon, where the artist grew up. 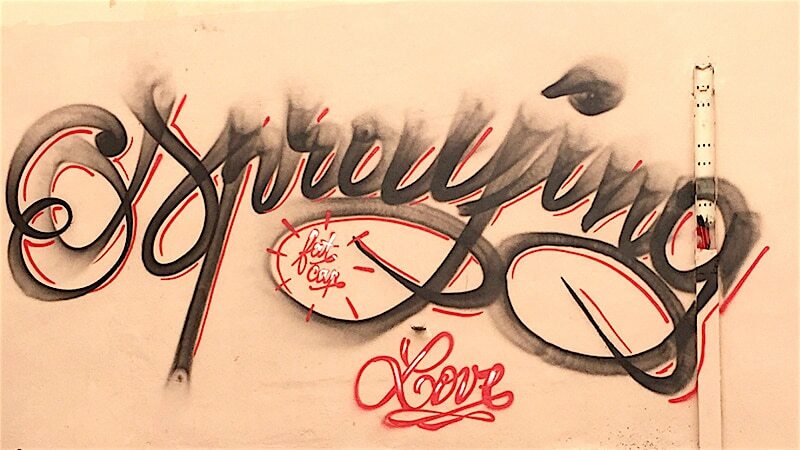 He started painting in the late 80s, when graffiti was becoming popular around the world. Georges de Loup is just one of the pen names the artist paints under. This pen name focuses only on love. He can paint up to eight pieces in one night, spending between five and 45 minutes on each one. He doesn’t paint every week, though, and usually only does one or two paintings when he does. He lets his inspiration come naturally. He chooses places based on the goal of the specific piece, if he wants a lot of people to see it or if it’s meant for one person in particular. Georges de Loup’s work spans all the emotions of love, both good and bad. People react to it based on how it relates to their own lives. He doesn’t think it’s bad to see only the good side, though. People see what they know, he says. Graffiti-painting always has its dangers, but Georges de Loup is one of the artist’s more celebrated characters, attracting people of all ages with tattoo-like imagery and symbolism. The artist sees street art as a way of conquering fear and reaching out to the world. Creating Georges de Loup gave him a way to express his most intimate feelings, to see that reaction, without ever saying a word.